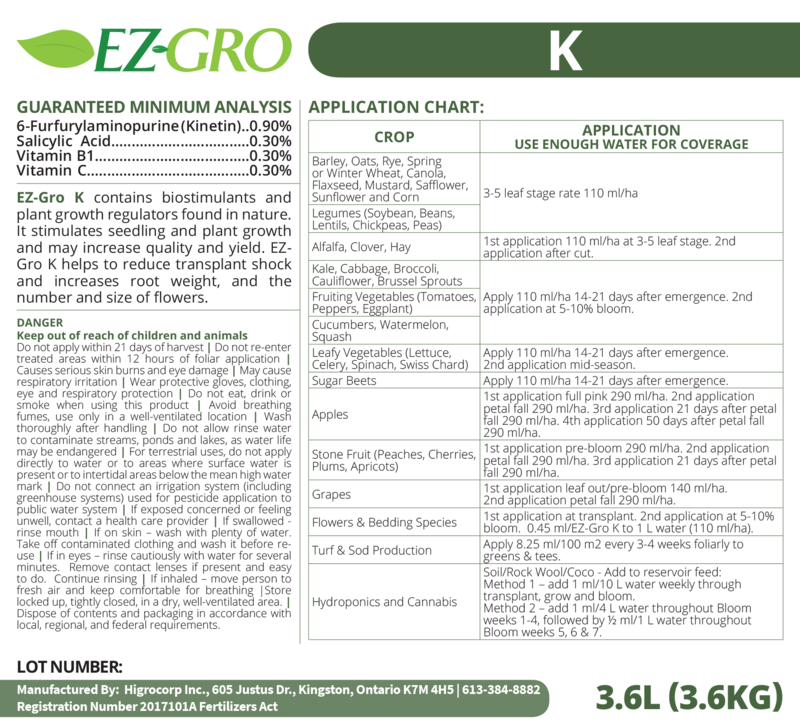 EZ-Gro K contains Kinetin, Salicylic Acid, and Vitamins B1 and C, natural plant growth stimulants, which play a vital role in plant growth and development, photosynthesis, transpiration, ion uptake and transport. Salicylic Acid improves resistance to drought and environmental stress, enhances hardiness, flowering and fruit yield, and aids in Systemic Acquired Resistance (SAR). When applied exogenously, kinetin can funnel resources toward the rapid growth of shoots and leaves. Apply EZ-Gro K to your crops to protect against abiotic stress, increase number and size of fruits, flowers, grains and pods, and improve overall quality and yield. • Cytokinins are a class of plant signaling molecules that are involved in the regulation of growth and development throughout the entire life cycle of most plants. Concentrations are highest in developing tissues like root tips and the shoot apex, due to their role in growth promotion. • Vitamin C has proposed functions involving photosynthesis as an enzyme cofactor (including synthesis of ethylene, gibberellins and anthocyanins) and in control of cell growth.